Submit your project photos and videos. 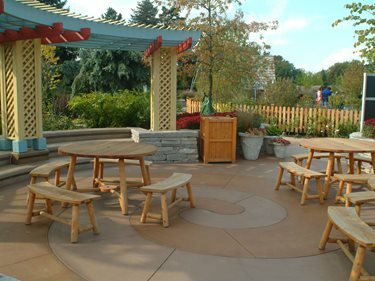 Decorative concrete in the award-winning Children's Garden is used as an educational "study guide" to help both adults and children learn more about their natural environment. Pathways and patios throughout the project help to create a sense of place by creatively interpreting themes to help visitors recognize different areas within the extensive four acre park. Virtually all of the 20,500 sq. ft. of decorative concrete which link areas throughout the project are integrally colored. In addition, some of the colored concrete is chemically stained or stamped with custom patterns that identify the plants nearby. "The decorative concrete treatment has served us in several ways," says Katherine Johnson, Morton Arboretum Children's Garden Manager. "It allows us to add a layer of detail to our educational message about trees. We know from talking with children and families that leaf patterns in the pavement have called their attention to the diversity of trees in the area. The concrete also helps brighten the garden in winter making it a more attractive destination when the foliage is gone." 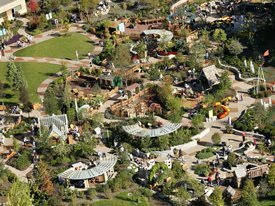 Hear about the benefits of using concrete on a project like the Children's Garden at Morton Arboretum in Illinois. 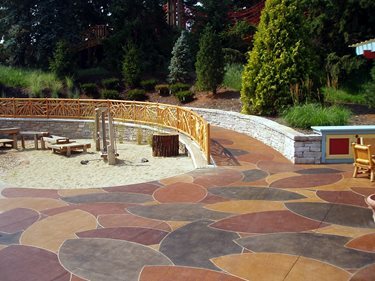 Beauty and creative versatility were not the only considerations for using decorative concrete, the landscape architects also were mindful of performance criteria and long-term durability. The walkways and plazas have to stand the test of very high use pedestrian traffic and light maintenance vehicles daily. Concrete also provides the flatness needed for accessibility without detracting from the featured plant attractions. To learn more about this diverse and very unusual large scale project, we interviewed the project manager, Eric Hornig, ASLA, of Hitchcock Design Group the landscape architecture firm that saw the project from start to finish. Eric was quick to point out that he was one member of a diverse interdisciplinary team working on the project for three years. At the outset the design team was led by EDAW during creation of the initial design and schematic vision. As the project progressed to design development, Hitchcock Design Group took the lead, but EDAW remained on the team in an advisory capacity. "Every member of the team recognized the potential of this project. The collaboration between the Fort Collins, Colorado offices of EDAW and the Hitchcock Design Group locally, here in Illinois, was unique. The level of dedication by the arboretum staff in doing research and providing substantial depth of information as the educational basis for the design scheme also was very unique for a client,"said Hornig. "All of us knew this would become a regional showcase of importance and the dedication to excellence was visible in the work of every member of the team, from the landscape architects to the concrete contractors. Every member of the team brought their personal best to the project; you can see it." "The intricate spiral designs in the Gardeners' Workshop area, where hands-on learning takes place, were an ambitious design," remarked Hornig when asked about the challenges of a project of this scope. "We were a little nervous about getting it right. However, we had the luxury of a lengthy design phase in which custom shapes and applications were detailed. We also had very skilled and talented concrete contractors and artisans, so it all came out just fine in the end." The Children's Garden has been the recipient of six design awards, so it turned out much more than "fine." The project team included specialists in many areas: civil, mechanical and structural engineers, architects, fountain designers, soil consultants, irrigation designers and others. The construction managers, from Featherstone, Inc, Jim Boyd and Tom Featherstone, played a major role daily during the year of construction; and the Hitchcock Design Group team often was on hand. Elliot Construction Corp. was responsible for all aspects of the concrete installation and managed the ready-mix producer and the concrete staining sub-contractor, Julie Thompson of Designing Concrete. Mike Bradley, of Elliot Construction Corp. said, "The project was more challenging and more fun than many we handle. Forming the spirals with alternating colors radiating from the centers was no easy task. We do curved walkways frequently in commercial projects, but this was more complex. Each different integrally colored panel had to be poured separately. Our experienced crews know how to work with flexible, bendable materials for forming within tight requirements." He continued, "We had good drawings for the visual concepts, but there are always some practical changes to be made on-site. Fortunately, Hitchcock was readily available to come to the location to discuss our ideas when adjustments had to be made during construction. We also have a long-standing relationship with Ozinga Illinois, a ready-mix producer we could trust for high standards of quality control and a consistent mix for every pour." When staining sub-contractor, Julie Thompson and her crew where given the drawings, she was impressed with the attention to detail defined by the landscape architects. Thompson's crew spent almost a month on the Children's Garden staining accent areas, such as randomly placed sections, and one focal point of large scale overlapping leaves using five stain colors. Before starting there were some challenges to address. "We received illustrations which told us exactly what the leaf patterns should look like. Deciding how to transfer the pattern to a large area on the walkways and gathering places was left up to us. No templates of that size existed, so we had ours custom-made. We had several very large plastic leaf patterns created to our specifications. The templates were used as a guide to mechanically chisel out a defining edge around each leaf with a specialized concrete engraving tool and bits made by Engrave-a-Crete," said Julie Thompson. This chiseled edge provided a stopping and starting point for separating each of the five stain colors while they were wet. Remarking that the scale of the project required much more planning than smaller projects, Thompson added "the schedule had to be coordinated with all the other work on the project, because chemical stains must be thoroughly washed and neutralized to remove the residue. The stained concrete has to be protected until it is sealed." Thompson's company also was responsible for the big job of sealing all the concrete in the park. Using a durable and compatible sealer was important to enhance the colors and protect the concrete from spills and environmental stains to keep them looking good long-term. With so much going on, how do the design concepts get translated from paper to concrete and come out great? Mike Bradley points to the use of jobsite samples as the best way to make sure every member of the team has the same vision. The colors produced with integral color and stains were reviewed early, while changes could still be made, before the real work started. The project was successful in meeting the objectives set out by the Morton Arboretum and it has become a major regional recreational attraction. The landscape architecture firm believes that the unique use of the decorative concrete flatwork contributed to the success of the project. Not only were the warm colors which blended into the environment much more inviting than plain old grey concrete would have been, Eric Hornig describes the unique role the concrete played in delivering messages that supported the educational goals of the four acre Children's Garden at the Morton Arboretum. "Adding to the interpretive signage, exhibits and detailed surroundings, the concrete became an educational study guide. For instance, in one area, a custom concrete stamp representing a plant genus leads children down a path to real leaf prints imbedded into the concrete. This resembles the forest floor and encourages children to try to find the same leaf on a tree in the surrounding area. It's interactive and more subtle than a textbook." According to Hornig, "Definitely the whole experience is fun, but visitors are learning all the time." "Ultimately the Children's Garden offers great creative versatility to visitors," said Hornig reflectively. "It is dynamic and surprising at every visit, partially because there are over 18,000 plants in different seasonal stages all year-around, and partly because of the strong vision which unifies it. One measure of success that I have noticed in my own young daughters â€“ they always want to stay longer at the Morton Arboretum. It truly is a garden for children and their families, but it is also an inviting space for all ages." Visitors must agree. More than 830,000 have trod the attention-getting and durable decorative concrete hardscapes since the project opened to the public. AA Conte & Sons, Inc. Precision Metals & Hardware, Inc.
Landscape Architect Magazine, the national publication of the American Society of Landscape Architects (ASLA) has called the Children's Garden "The Best Backyard in the World," because the garden is fun for youngsters, and sparks their curiosity about nature. The jurors from the Indiana chapter who judged the Illinois entries concluded the garden "exhibits leadership, sensitivity and highly effective education," according to Ann Viger, ASLA Illinois Chapter President. Ms. Viger visited the Children's Garden, and later said, "I spent an hour there. I wish I could have spent the whole day." The four acre Children's Garden was added at the Morton Arboretum, in Lisle, Illinois, as part of an extensive "Branching Out" program undertaken over a six year period. The whole of The Morton Arboretum covers 1,700 acres (6.9 Square kilometers) with various plant types and trees. It includes some native woodland forest preserves and a restored Illinois prairie. It has over 4,000 different species of trees, shrubs and other woody plants from around the globe and offers 14 miles of hiking trails for recreation. The Arboretum provides a year-round education program for children and adults.